I had trouble getting into the story. There is a lot of information spouted about quantum physics and then there is the constant vocabulary lesson. Seriously, 8th graders should know how to use a dictionary if they can't decipher the meaning from the text so the author shouldn't need to define the words within the text. It made Charley sounds like a know-it-all since she is the first person narrator, and it did not endear me to her. If she is supposed to inspire other middle school students to be excited about science and engineering, I think she failed. She is too much of a negative nerd stereotype. I also had trouble with the plot. It felt jagged and kind of all over the place. I kept waiting to get to the story because it really just felt like it was setting up who the characters are and what the story is about. There is some conflict between Charley and her best friend Beth (apparently Beth ditched Charley for a guy). Billy, Charley's other best friend, is in love with her but Charley doesn't know so there is some tension there. Which is why he quickly capitulates when she wants to focus their science fair project on Da Vinci's time machine even though he rather focus on flight. This book is basically just background information; the real story seems to start in the next book. It is just over 100 pages (plus there are pictures) and right at the end there is finally some action - Charley is transported back to Renaissance Florence. And then the book ends. We were just getting to the meat of the story and it ends! If I hadn't already had book 2 I wouldn't have sought it out. This book was a little better than book one because it moves more into the meat of the story. But the story was still too choppy for my liking. 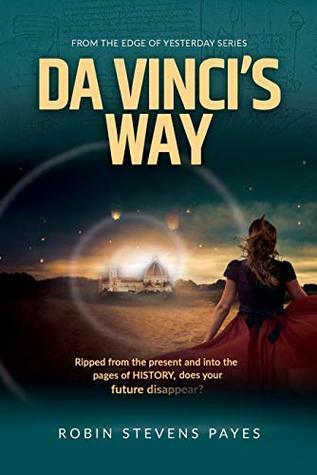 Charley arrives in Renaissance Florence in the middle of the night and then Da Vinci sends her on a cross-country trek to his rooms over a tavern on her own while she is injured. I don't know if he really thought the tavern owner would take her in and feed her but that seems to be his intentions. And though Da Vinci told her not to show her tablet to anyone, she pulls it out when the tavern owner doesn't understand she wants spaghetti and tomato sauce (which also shows why a liberal arts education is still a good idea - tomatoes are a new world fruit and the new world hasn't been discovered yet). Charley would have been better off if she knew as much about the 15th century as she does about quantum physics or vocabulary. It is still a bit too thin on the plot as well. Da Vinci keeps saying he wants to learn from her and obviously Charley wants Da Vinci's help getting back home, but all they do is run around Florence. And why was the story recapped at the end? 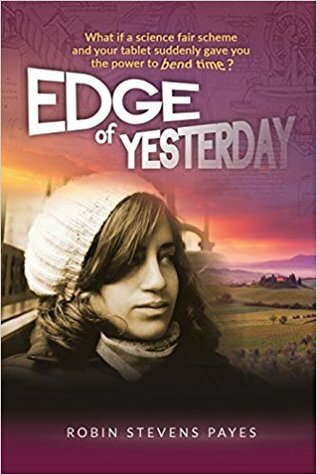 Can an 8th grader not retain major points of a story from start to finish? That's hard to believe given that the book is only 129 pages (and there are a few pictures). The book ends on a cliffhanger. Though there is a sneak peek at the next book, I'm not interested in continuing and didn't even read the sneak peek. I was looking forward to a fun time travel story that taught some principles of science and history. And while every time travel stories require a certain amount of suspension of belief, they usually try to make it sound believable. Yet, that attempt is not made with this series. I'm really starting to think Charley didn't time travel but is dreaming the whole series. Like she can communicate with Billy and see videos from her parents.